The likelihood of them deciding to buy something from you is often based around the levels of perceived risk they associate with you. This is where positive reviews come in handy. In this post I will show you the importance of using reviews in your marketing, and how to proactively curate them. Or in some cases, all of the above. One of the most tried and tested methods you can use to reduce their level of perceived risk is to prominently display customer reviews and testimonials on your website (and encourage customers to leave reviews on other websites as well). Getting reviews from your customers can be tough, and I have found it is more effective to have a rolling program of collecting reviews rather than attempting to get them on a one off/ ad-hoc basis. That way you have a steady stream of reviews coming in you to use as and when you need them. This obviously presumes your customers have some form of account control panel in the first place, but if you do, make sure you have a page dedicated to them giving you feedback e.g. “Let us know what you think”. If you don’t have a website that uses a control panel, you can create a page on your website with a feedback form – see below. At the end of an order is a great time to target people for a testimonial. They are generally feeling positive after a successful transaction and you are at the forefront of their mind. This makes them more likely to be open to taking a minute or two to send feedback. Use any positive tweets or Facebook comments on your website. These are much more difficult for a company to fake, which means they are more credible and carry much more weight. I would also recommend linking to the tweet to show it is real. See my examples below for this in action. If you use emails to communicate with your customers, simply add a link to your feedback form (as described above). This all also applies to any final email you send out at the end of a transaction e.g. a solicitor’s “Thanks for using us to move home” email. If you use the post to communicate with customers, send a form with your final letter and a pre-paid envelope asking for feedback. You’ll be amazed how many people are willing to do it, especially after a positive experience. You can offer an incentive for people to make the effort and increase the number of testimonials you receive. The prize doesn’t have to be anything pricey or extravagant to be successful e.g. “Tell us what you think and enter prize draw to win your next meal free”. Additionally, if you want people to leave reviews on other websites, you can also encourage more people to do so by rewarding them. I have seen one company successfully increase their visibility by offering customers $5 account credit for every review they leave on industry related review websites. Where to use your testimonials? Hopefully this should give you a nice collection of reviews to work with. The next question is what to do with them? My advice would be to use one or two on pretty much all your customer acquisition marketing material. The more prominent they are, the more impact they are going to have. Here are some great examples of websites using the positive feedback they have gathered for maximum impact. They work to reduce our levels of perceived risk and drive us on to the next stage of the conversion funnel. You’ll notice a lot are using customers’ faces along with the quote. This adds a lot more credibility and weight to them. Moz use this section on their home page, just above a call to action button to purchase their services. They use pictures, names, job position and the company to make these as credible as possible. We use rotating positive tweets at my own company on the home page and all the product pages to showcase all the positive feedback we get. We intentionally chose tweets from accounts that used people’s faces as the avatar. WooThemes have chosen to showcase positive tweets from their customers on their home page as well. 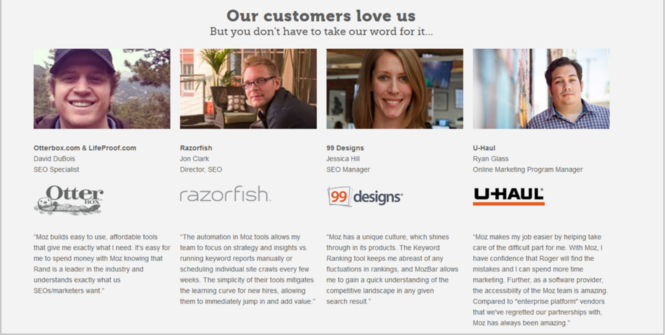 VWO uses some prominent names that resonate with their target audience (and their pictures). Good post. I have just one remark. Not only should we care about testimonials and reviews when client is satisfied and happy with the service provided. Negative critics are incentives for producers or service providers to improve quality of its products. With no prize predicted for testimonials, no effort needed to resend review required from customer, we could simply use e-mail form to get objective opinion of customer. Thanks for the feedback. I agree negative feedback is important to help improve your products or services, but I certainly wouldn’t use them to try and draw in new customers. I agree. Negative feedback can increase sales only directly by improving the quality of services and getting new consumers happy with the higher quality of products or services.